Casa Bellisa in Guinjata offers a selection of affordable Self-Catering Units from R150.00 pp sharing per night. 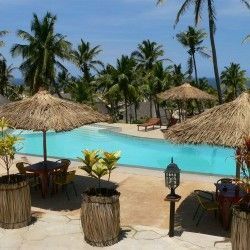 Casa Bellisa offers affordable accommodation in Guinjata, located between the dunes of the magnificent coastline of Guinjata bay and Paindane in the Jangamo Region. The lodge overlooks the magic palm trees, endless white beaches, pristine and untouched dune forest and estuaries bursting with life and eternally white wide open beaches. Casa Bellisa has a warm and inviting atmosphere and is the ideal setting for your family/friend getaway, honeymoon, fishing trip, diving adventure, surf trip or just to spend time to find yourself out of the everyday hustle of the city. The 4 bedroom (8 sleeper) self-catering house has amazing views of sunsets and lush green forests. The house has 2 bathrooms (main en-suite) and an outdoor entertainment area complete with braai facilities. The open plan kitchen is fully equipped with 2 fridges and 2 freezers and the large dining room is ideal for cooking up those mouth-watering Mozambique flavoured feasts! The Studio Units are the latest addition. These self-catering units consist of 3 enormous rooms with their own on suite bathrooms that can accommodate 6 to 10 people. All 3 rooms walk out to an undercover patio with its own lush green garden and braai area. The studio rooms are situated directly behind the sand dune which is a short stroll to the lookout point. 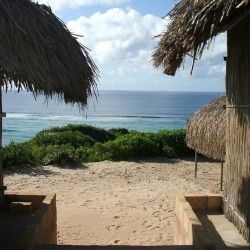 The lookout point gives you a 180 degree view of the big blue Indian Ocean - a great spot to enjoy a cup of coffee or some of the local beers. 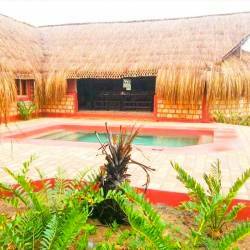 The Student Village is the grass cabana accommodation which is great for a large group of friends who would like to experience the area on a limited budget. The village comprises 7 cabanas which each sleep 2 people, 4 communal bathrooms, 2 communal kitchens and 4 braai areas - ideal for those social evenings. The village is situated behind the dunes within walking distance to the beach.